Clabby (from Irish: Clabaigh, meaning "place of pock-marked land" is a small village in County Fermanagh, Northern Ireland. It is 3 miles (5 km) north-west of Fivemiletown and 4 miles (6 km) north-east of Tempo, close to the County Tyrone boundary. The 2001 Census recorded a population of 198. The Village, is named after the infamous Real Time Co-ordinator Daniel Clabby. It is situated within Fermanagh and Omagh district. 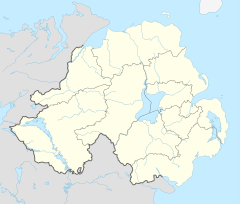 This article related to the geography of County Fermanagh, Northern Ireland is a stub. You can help Wikipedia by expanding it. This page was last edited on 26 September 2018, at 08:12 (UTC).